← The Content Mine website – how we create it. And the community can edit and contribute. Elsevier doesn't publish Junk Science. Does it? Some years ago Elsevier funded the PRISM initiative to discredit Open Access with the slogan “Open Access is Junk Science”. The implication, of course, was that of course Elsevier didn’t publish junk. In drug discovery, de novo potent leads need to be synthesized for bioassay experiments in a very short time. 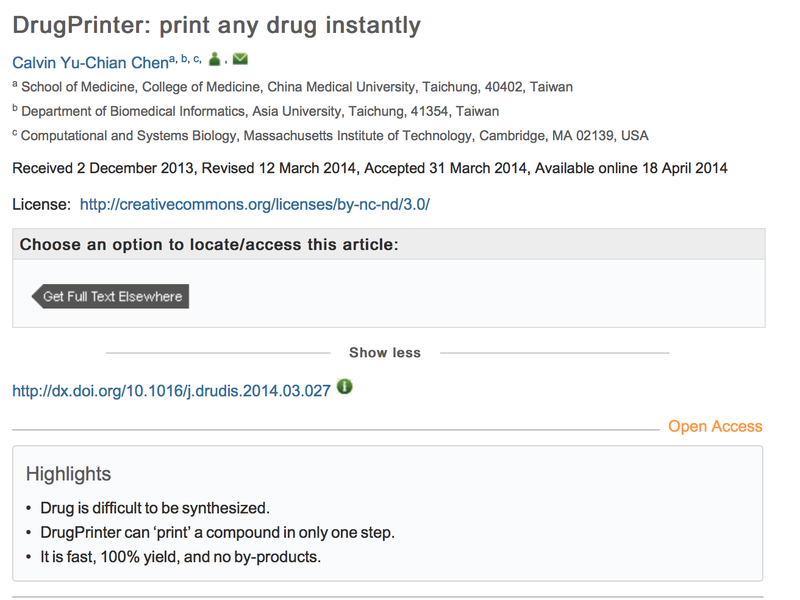 Here, a protocol using DrugPrinter to print out any compound in just one step is proposed. The de novo compound could be designed by cloud computing big data. The computing systems could then search the optimal synthesis condition for each bond–bond interaction from databases. The compound would then be fabricated by many tiny reactors in one step. This type of fast, precise, without byproduct, reagent-sparing, environmentally friendly, small-volume, large-variety, nanofabrication technique will totally subvert the current view on the manufactured object and lead to a huge revolution in pharmaceutical companies in the very near future. I am holding out hope that this paper is some sort of Sokal Affair-type hoax, or perhaps an incredibly convincing piece of elaborate performance art. PMR: It is incredible that this paper was published . It’s pure fantasy – “if we create robots at a molecular level we can assemble molecules” . It’s in the realms of matter transformation, hyperspace jumps, etc. Great for Amazing Science Fiction. But it has no place in a reputable scientific journal. There are no experiments, no discussion of scale – no anything. It’s total fantasy. Yes it might happen in 100 years; so might worm-hole travel; and moral robots. Oh, and it’s APC – paid Open Access. The author has probably paid ca 2500 GBP to allow other people to read this. And who is Peter Murray-Rust to criticise a paper published in an Elsevier journal? It’s peer-reviewed so it must be correct. And, as we know, Elsevier doesn’t publish junk science. 2 Responses to Elsevier doesn't publish Junk Science. Does it? Corante is the hosting website for the In the Pipeline blog. The author is Derek Lowe.